Elsa's Wedding Cake. Games online. Elsa is busy in the kitchen finishing a wedding cake but she needs creative assistance for the final touches. 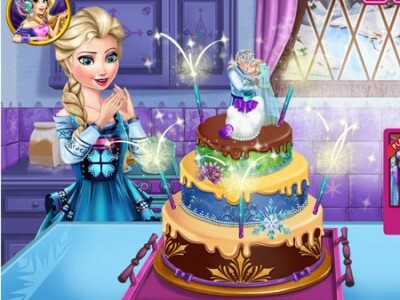 Help Elsa make one of the most beautiful cakes anyone has ever seen. Choose from tens of marzipan, chocolate and fruit dressings, toppings and candy decorations. Add some firework candles on top and turn the cake into a masterpiece.